1. Marinate the poussins in the oregano, sherry, garlic, paprika, lemon zest and juice. Set aside in the fridge for at least 1 hour, or preferably overnight. 2. Preheat the oven to 200°C, gas mark 6. 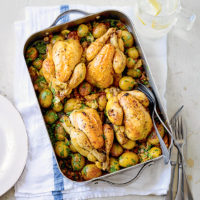 Place the potatoes in a large roasting tin, scatter with the pancetta and artichokes, and finally add the poussins with any marinade juices. Drizzle with 1 tbsp of the oil from the artichokes, season and place in the oven to roast for 1 hour until the poussins are cooked, there is no pink meat and the juices run clear. 3. Sprinkle with parsley and serve with green beans.